Timothe Luwawu-Cabarrot - 83/99. 2016-17 Select Die-Cut Rookie Autographs Pulsar. You will get the exact cards as the title said and the photos shown with top loaders for protection. You will also get several random chosen base cards from my own collection. Nice Card! Nice to collect! 2017-18 Panini Donruss Optic Basketball Green #113 JJ Redick 76ers /5. Shipped with USPS First Class Package. Let me know if you have any questions! 2017-2018 Panini Encased Perfect 10 Markelle Fultz Rookie Auto Red 25/25 🏀🏀🏀. Condition is Like New. Allen Iverson Autograph Card 06/25. Condition is Brand New. Shipped with USPS Parcel Select Ground. 2016-17 Joel Embiid Studio Rock Solid Die Cut. Card is graded a Gem Mint 9.5 from Beckett (Quad 9.5) . CARDS ARE MINT TO GEM MINT STRAIGHT FROM PANINI ENCASED AND UN-TOUCHED. ONLY 5 MADE. Ships with top loader. 2018 19 BEN SIMMONS PANINI PRIZM RED REFRACTOR #112/299 76ERS. Condition is Like New. Shipped with USPS First Class Package. 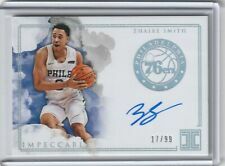 You are bidding on a 2018-19 Panini Prizm Landry Shamet Rookie RC Red #199 Philadelphia 76ers Don't miss out on this great card! Please email me if you have any questions. If you buy 10 auctions or more then shipping is FREE! 2017/18 Panini Noir Charles Barkley Spotlight Signatures On Card Auto /15 76ers. Condition is Brand New. Shipped with USPS First Class Package.